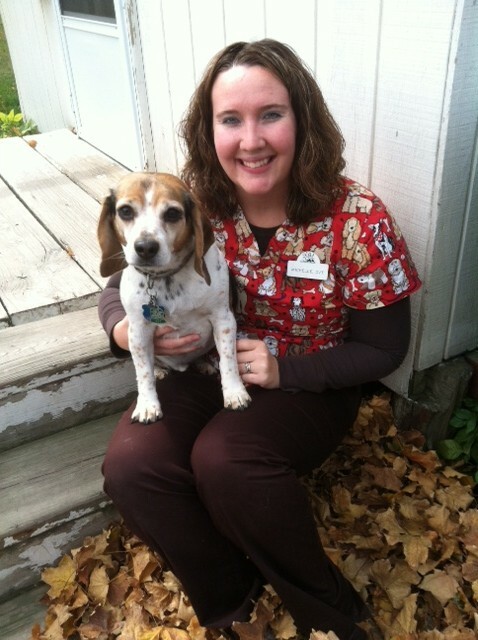 Michelle Bammert | All Pets Medicine, Surgery and Rehabilitation Clinic, P.A. Michelle Bammert grew up between Minnesota Lake and Wells, MN on a farm where she has always had a love for animals. She graduated in 2004 from Maple River High School in Mapleton and started her college experience in Marshall, MN at Southwest Minnesota State University. She was a pre-vet major, but decided after doing some research that she wanted to become a Veterinary Technician. Michelle then transferred to the Minnesota School of Business in Shakopee after her first year of college, and graduated in June 2007 with an Associate’s Degree in Veterinary Technology. Michelle completed her internship here and she was then hired after graduation. She is really happy to be working in Mapleton at All Pets! Michelle lives in Mapleton with her husband Mike, son Jace & daughter Amelia. They have a beagle named “Charlie”, 3 cats “Simba”, “Nala”, “Iris” and a turtle. Besides her love for animals, Michelle enjoys being outside, fishing, camping, playing/watching sports, bowling, bingo, playing cards and spending time with her family and friends. Michelle is also a member of the volunteer fire department in Mapleton.